Would you like your employees to be happier + more energetic, and as a result, more productive? Would you like to see a decline in stress-related sick occurrences? Do you and your employees deserve the opportunity to reduce stress + tension + become more physically fit? If you answered YES to any of these questions, then it’s time to give your team the gift of wellness. Start a corporate Yoga program. Lara offers Yoga workshops and corporate Yoga classes that are customized to fit the needs of your company and employees. 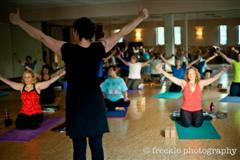 Corporate Yoga Classes are typically 60-90 minutes in length and extend over a 8-12 week period. All props are available for use during class or for purchase. Students are encouraged to bring their own yoga mat + to wear comfortable clothing. A warm, private + open space at your facility is ideal. Boardrooms, large offices and rooftop decks are all popular choices. 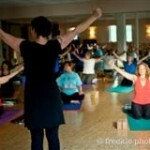 Consider what Yoga can do for your business.